Waitakere Magpies complete undefeated season - just. 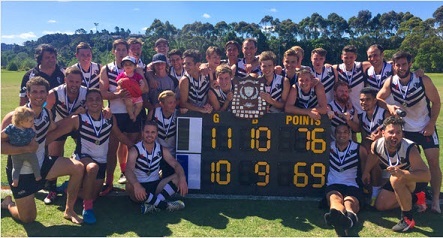 AFL New Zealand report that in ideal conditions the Magpies got off to a flier with 3 quick goals, and were on top early largely via the efforts of mids Carlos Donnell-Brown, captain Shane Leat and the experience Dave Rattenbury. The Blues fought back into the contest, rallied by their coach Chris Mundell. The dangerous Blues focal point Thomas Taungakava was well held most the game but when Magpies defender Ben Pine was moved up field; Taungakva was able to work into the game with a couple of late goals - the Blues kept coming and whittled the deficit down to just 5 points with 5 minutes to play. That was as close as they got to perhaps pinching an unlikely win. The Magpies absorbed the pressure and held on by 7 points to be deserving winners over a worthy opponent. The Magpies last won the pennant in 2013, but after such a successful season and with a solid and talented squad - they are clearly the bookmakers favourite for next year - in early markets!! Leading goal kicker Bradn Johnson (an Australian) was again a key target up forward with 4 majors, ably assisted by Jamie Hunt with 2. The 'Wells Medal' for BOG went to Carlos Donnell-Brown who wrapped up a very successful finals campaign for the Pies. For the vanquished - full forward Nick Trask slotted 3 while better players included Steph Tabaillou and Conrad Doggett.